42U SmartRack Enclosure ships mounted on a special pallet that features additional reinforcement and shock-absorbing material. The pallet's protective cushion safeguards the enclosure and the precision components it contains during re-shipping. Reinforced pallets and reusable packaging provide the flexibility to fully configure rack enclosures in a centralized location and safely re-ship them to remote sites, saving significant service costs. They also allow the freedom to custom-configure enclosures with network and server hardware along with UPS systems, PDUs, KVM switches and a variety of other devices prior to final installation. SmartRack enclosures are designed for secure, high density server and networking applications in IT environments. Designed with provisions to integrate cooling, power distribution and cable management, SmartRack enclosures make ideal homes for mission-critical equipment. Vendor-neutral square hole/cage nut mounting for guaranteed compatibility with all EIA-310-D compliant 19 equipment. Enclosures ship fully assembled for rapid deployment and roll into place on heavy-duty casters. Toolless mounting slots allow quick installation of PDUs and vertical cable managers. Adjustable mounting rails include an easy-view depth index to eliminate time-consuming measurements. Lightweight modular doors and side panels provide safe, convenient service access. Integrated baying tabs facilitate combining enclosures in rows for standard data center baying applications. SmartRack enclosures hold up to 1360 kgs (3000 lbs.) and support cooling, cable management, power distribution and monitoring features that keep critical servers and network equipment operating nonstop. Perforated doors permit massive front to rear airflow that exceeds servers manufacturer requirements. Enclosures are fully compatible with hot-aisle / cold-aisle data center configurations. - Standard 42U SmartRack enclosure with additional shock pallet and loading ramps. - Final Installation Capacity: SmartRack Enclosure supports up to 1360 kgs (3000 lbs) of equipment stationary and 1020 kgs (2250 lbs) rolling. - Ships fully assembled for rapid deployment and roll into place on heavy-duty pre-installed casters. 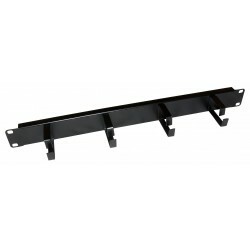 - Front and rear sets of equipment mounting rails adjust in 1/4 increments. Adjustment is quick and convenient. The easy-view depth index ensures consistent rail placement without requiring time-consuming measurements. - Toolless accessory mounting rails (2 rails per enclosure) include slots for quick installation of compatible PDUs and vertical cable managers. Mounting slots are arranged in an industry-standard pattern compatible with a wide variety of accessories. Each rail can accommodate two vertical PDUs or cable managers side-by-side (four items per enclosure). - Enclosure includes mounting hardware of 50 pieces of M6 cage nuts and 50 pieces of M6 screws. - Textured powder coat finish for tough resistance to environmental concerns such as deployment in warehouses. - Massive front to rear ventilation capacity. 65+% open space in door perforation pattern meets or exceeds server manufacturer requirements. - Maximum usable internal depth of 37 inches/94 cm (front to rear rail). - Weight ratings of 1360 kgs (3000 lbs) stationary and 1020 kgs (2250 lbs) rolling. - Front door is locking, reversible and removable. - Rear doors are locking and reversible. Split rear door design reduces clearance requirements for service entry allowing the enclosure to be placed closer to a wall. - Locking removable side panels are 'half size' to make them smaller and lighter improving ease of installation and servicing. Two side panels per side (4 panels total). Side panels are keyed alike to the front and rear doors. - Built in baying tabs allow enclosures to be combined securely in rows. Center-to-center width can be set at 600mm or 24 to match standard data center floor tiles. - Casters are pre-installed and support a rolling load capacity of 1020 kgs (2250 lbs), allowing the enclosures to be pre-configured and rolled to the final installation location. Casters are removable. - Leveling feet extend to allow enclosure to be positioned on uneven floors. Levelers are removable. 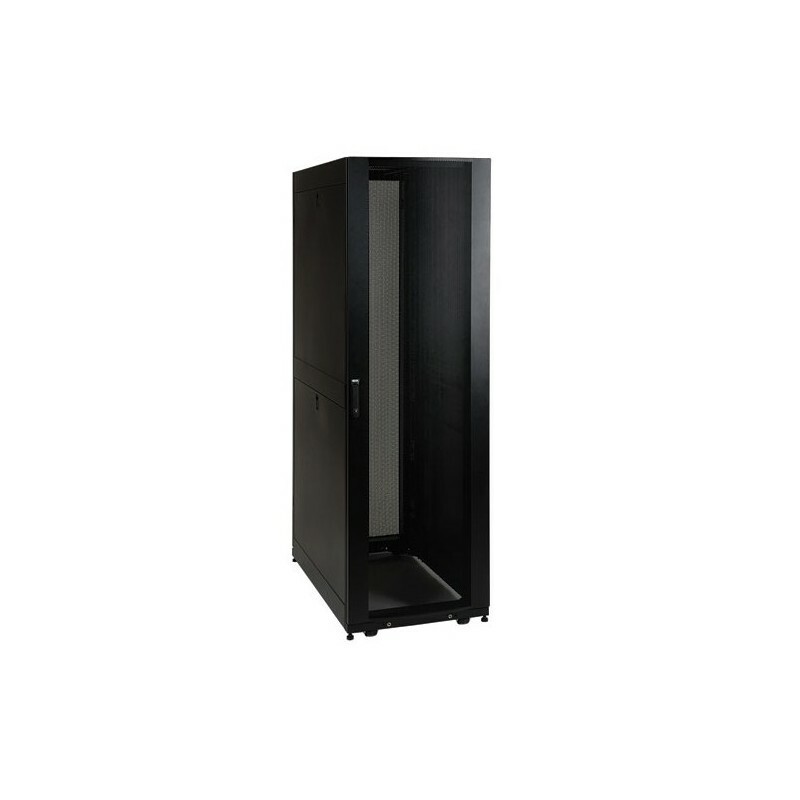 - Compact design allows the enclosure to roll through standard height commercial doorways. - Convenient grounding system. All components are grounded to the enclosure frame which includes multiple connections for facility ground. Front and rear doors include quick-release ground wires. - Open bottom for cable access. - Top panel has generous cable access holes. 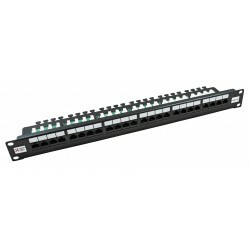 Panel can be removed toollessly in seconds without having to disconnect cables first. - Included stabilizing brackets are used for shipment and can be reattached at the bottom of the enclosure frame on the inside or outside of the rack. 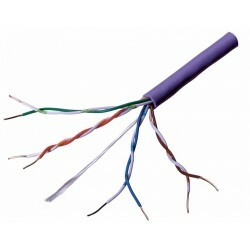 - Compatibility with airflow optimization accessories as well as cable management accessories.